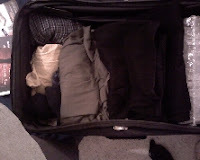 Picture of: my suitcase, partially packed. You can tell I am a big fan of rolling to pack. Or maybe you can't. Today I: ran from thing to thing; wrote a new blog post over at the other blog; talked in Email at length; learned a new folktale; followed up with a corporate storytelling client; prepped for my the "guys" retreat I am leading this weekend; told my youngest that I am leaving this weekend on a road trip. Her answer was "oh" and she went back to her computer games. My kids don't know anything else other than me being gone on trips so my leavings are par for the course. Some dads go to the office, I go to the airport. They don't call me Dad. I am leaving town, the SuperBowl has arrived. 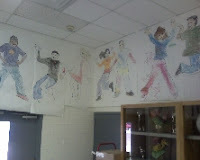 Picture of: the top of the cafeteria wall at the school where I performed today. These are drawings that kids make: lay on a piece of paper, have someone draw around your body, then color the picture in to look like you doing what you like to do. There were about 40 of these all around the room. Today I: performed my storyteller show in an after-school program at a school; messed with the national organization to get them to refund dues for products not delivered- gawd I am really not that crabby; started the review process for the Emergent Storytelling Series we had last weekend. It was very good. Picture of: the card my middle daughter hand made for me today. The character in the center is a construction-paper rendering of a "toon" I have in the online MMORPG game of "Toontown," which is a favorite for me and my children to play together. I refer to Toontown as the gateway crack to get kids ready for things like Warcraft. It's ok if you don't understand that last sentence. LOL. Today I: had a storytelling coaching session with on of my storyteller clients in regards to the use of movement and gesture to indicate characterizations in an epic tale; taught a session at South Mountain Community College on my new "Outside In Storytelling Model"; did an interview with Priscilla Howe about our upcoming Marketing camp and turned that into a mini-podcast. Very full day. 01.27.08 Sunday: Putting Away ESS Stuff. 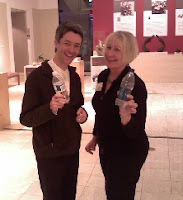 Picture of: storytellers Tim Ereneta and Liz Warren pre-show at the Emergent Storytelling Series last night in Arizona, debating the finer points of water bottles vs crystal glasses vs martini glasses vs margarita glasses for the proper container to hold the water a storyteller needs on stage. Today I: am in low gear, putting away things from the ESS; took Tim back to the airport; made "notes to self" about the things I learned producing this event; started to pull together the final notes for my Baltimore storytelling trip next weekend. 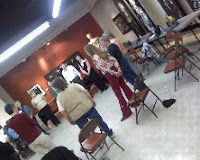 Picture of: participants in Tim Ereneta's "Improv Skills" workshop at the ESS today. Today I: oversaw the Emergent Storytelling Series #1 presented in Surprise (Phoenix Area) Arizona by the Arizona Storytelling Guild. Tim was our invited guest teller from the Berkley, California. The event featured both Tim and several members of the guild. The afternoon workshop was great as well. Good time. Good times. I am very happy with the ESS and the whole overall concept of "Come Listen to the Best Voices in Storytelling that You Haven't Yet Heard." This is a keeper. 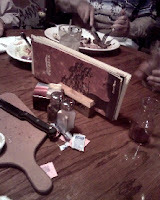 Picture of: the table at the dinner where some of our members of the Arizona Storytelling Guild had a pre-event dinner with Tim Ereneta for our Emergent Storytelling Series. Today I: ran around like a crazed storytelling producer getting ready for the event. 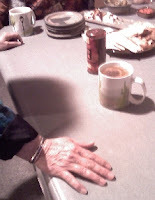 The dinner, however, was great fun and the first time in my life when the "pass the bill around the table" thing actually produced more money than was needed. Good people. Good food. Good conversation. 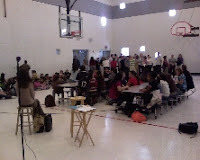 Picture of: kids gathered in the school cafeteria during the "lockdown" that was called during my storytelling session today. Today I: was the guest storyteller and told stories to school children until the school was put into lockdown while a missing child was located. Lots of police, some frightened children and even more disconnected teachers. Are we really off the clock ? It was disturbing on many levels. 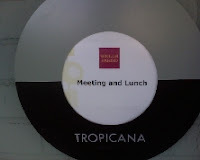 Picture of: the room sign outside the room where I taught day 2 of 2 for the corporate storytelling training. Today I: finished the class with my clients today, focusing on the new process of "Interpret. Express. Integrate." that I have been creating for the users of story along with the "Outside In Storytelling" process that is for the storytellers. Overall , I am very happy with these new processes and projects; sold tickets for the Emergent Storytelling Series that will be this Saturday; was sad to see another local group still be starry-eyed about getting some "names." Sigh. Head. Wall. Beating Against. Giggle. 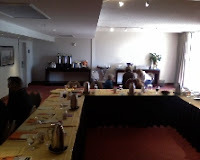 Picture of: the training room and some folks working in breakout groups in the corporate storytelling event I am teaching in Scottsdale this week. Today I: picked up a rental car; spent a lot of time at Kinko's; drove out to Scottsdale to teach this storytelling workshop (day 1); taught part one of the workshop with some really nice people in the class; took a lot of Ibuprofen to balance this bad back...that I have from standing and teaching today; readjusted my Tuesday class to better fit the issues that came up on Monday; made more copies and went to Kinko's some more. 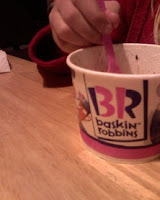 Picture of: my youngest finishing her 31 flavors ice cream, of which she only had 2. If you have taken any of my corporate training, you know that I teach a process of "Intentionality" in developing your storytelling for corporate or any setting. This is my picture of my "intentional thought" of the day. I'll post about it in my regular blog later this week over at www.seanblogs.com . Today I: spent a lot of time catching up on family things such as shopping and making dinner, running kids to places, buying ice cream; worked the final touches on handouts for the corporate storytelling gig I have on Monday and Tuesday. 01.19.2008 Saturday: I Teach. I Tell. I Produce. 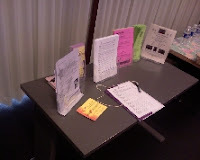 Picture of: the first pic is from the sign in table from the Storytelling Amigos meeting held today at the South Mountain Community College-Storytelling Institute program in the Phoenix area. The second picture is the water-bottle's-eye-view of Liz Warren telling at our Storyteller.net @ Borders night, which we do every third Saturday of the month at the Borders Books store in Avondale, AZ. Today I: taught a marketing segment at SMCC on marketing with postcards (part of the OISBC experience); told stories (with Liz) to a small crowd at the Storyteller.net at Borders event; produced said event; spoke with a Arizona Storytelling Guild member about the finances of the soon gonna be here Emergent Storytelling Series event; ate the traditional after-Borders meal with my wife and children. 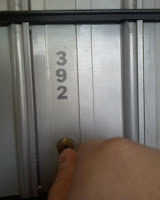 Today I: went to the post office, as I do everyday. Some days are diamonds, some days are dust. As a working storyteller, I depend on those checks to come in. Some sponsors are GREAT about deadlines, other are "what, oh yeah, we have to pay you." LOL. 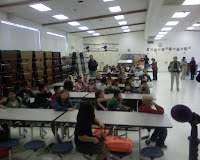 Picture of: children arriving for the after-school storytelling program I presented today. Today I: told stories to grade-school aged children for 90 minutes in an after school program. Yes, 90 minutes. The same kids. Sitting on those cafeteria benches. 150 children. Sometimes I adore my work storytelling. 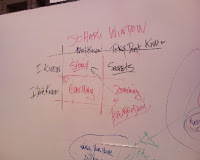 Sometimes I work my work as a storyteller. Looking back over the last few weeks of posts, I have not had many formal telling days. That is the way it is as an independent artist. Some days of all art, some days of admin. It's all good. Today I: sent Email blasts about my next Southern California tour (March 6-11); met with the AzSG to share stories and talk about my "Roadblocks to Storytelling" post. 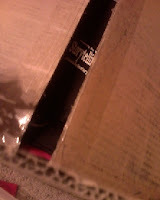 Picture of: a box that arrived today that contains some of the goodies for the the Outside In Storytelling Marketing Workshop. Today I: cleaned the kitchen; made pizza for my family; wrote a final comment Email; talked shop with Priscilla; kept breathing after yesterday's drama; got the package listed above- the OISBC will not be about swag, but there are a few fun things we're giving out. This package just made it all seem that much closer. There is still room if you want to register. Today I: moved around some Arizona Storytelling Guild pieces; booked a storytelling gig with local bookstore; finalized my Baltimore hotel stay for February; was reminded that people will walk on you if you let them. Or, better put, people treat you exactly like you have trained them to treat you- pavement (there it is) is meant to be walked on. I am sure tommorrow's picture will include some comment on this; realized I don't sleep enough. 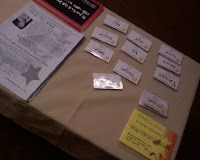 Picture of: business cards sitting on the lunch table from a person I met today who specializes in business networking. You never know who can help you out with your work and what you can bring to them. Today I: met for lunch with this networker. As a storyteller, everybody you meet is either someone you need to work with or someone who is within three contacts of a person you need to meet. Sometimes, they are both. 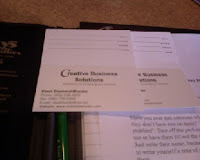 This person has a GREAT idea for busines cards and I will teach it to you at the marketing camp; talked with a friend who I had lost contact with; secured my tickets for the Cincinatti gig in February, travelling through Dayton. Crazy. NB: I do more in each day than I log here, thanks for the question. LOL. 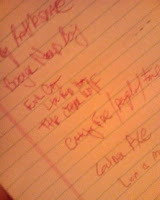 Picture of: the draft of a press release for the upcoming Emergent Storytelling Series in Avondale. You can read the press release here. 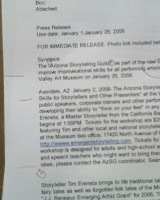 Today I: worked on this press release and others for the Arizona Storyelling Guild. I am lucky to live with a great proofreader, who catches most of our mistakes. LOL. Most of my press releases get picked up word. I know how to write a press release. Do you? 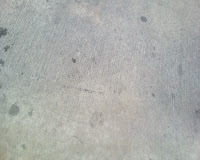 Picture of: the counter top for some snacks at our storyteller Sandbox meeting. Once a month, I get together with a few people and share ideas, stories, concepts with other storytellers of various storytelling formats, methods and motivations. It's our collective "sandbox" to work in. Tonight was one of our meetings. Goat cheese and tea. Funky. Picture of: looking over my laptop while I sat in the bagel shop trying to sort through the pile of writing and so forth that I needed to get done. Home offices are great but they can also be a confining greatness. Today I: cleaned my office, put away papers and closed out a huge part of the paper tiger of 2007; kicked myself in the behind for making public comments about the politics of storytelling when I promised myself I was taking 2008 off from doing so. If you don't want to know, don't read. 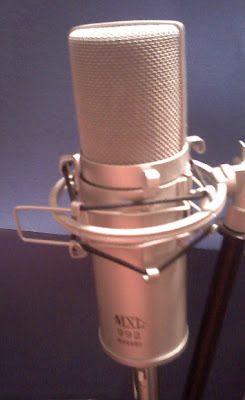 Picture of: One of the microphones in my home "studio" where I record podcasts and voiceover and CD projects. I must do more of these. Today I: recorded and published a brand new Podcast; launched the first public wide viewing of the "Outside In Storytelling" project. Picture of: Me and my kids eating at fast food. I travel a lot. When these moments of taking 1-4 of them out to lunch happens, I take them. In 2008, I'll be out of the US several times and on the road more than last year. Such is the nature of the itinerant storyteller. Today I: spoken on the phone to a Maryland storytelling client, added a new storyteller and coaching client to my list of the people I have the honor to work with; did more publicity for the Outside In Marketing Workshop. Really, if you are serious about being a working artist, you need to come join us for this camp; spent some time in Email with folks telling me that the NSN is really changing; spoke to the folks in Singapore about possible workshops. Full day. Picture of: Me, in 1979, performing in a library. Been doing this for 29 years. Funny, that hairstyle is now back in style. The sons of the 80's fathers now have their hairstyles of their fathers. Funny. Today I: am working on publicity for the "Outside In Storytelling Marketing Boot Camp" and sent letters with the above picture. Read the letter at this link here. 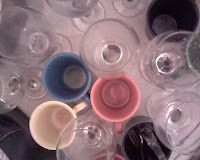 The Picture of: Cleaning up after the party. Those glasses held sparkling grape drink. Family party. Today I: took the day off, 'cept for fighting with the airlines over my flight I booked in November; and then trying to get to Cincinatti in February for less than $500 flight. I guess I didn't take the day off.